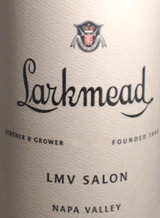 The 2013 Proprietary Red LMV Salon, which is a proprietary red of 74% Cabernet Sauvignon and 26% Cabernet Franc, is stunning. The Cabernet Franc seems to give this wine a tremendous fragrance, as the opaque purple color offers notes of cedar wood, underbrush, forest floor and spring flowers along with creme de cassis and black cherries. With a full body, ripe texture and moderately high tannins, this wine will benefit from 4-5 years of cellaring and keep 30-35 years.